For years, there has been speculation that the hit U.S. version of The Office will receive a revival, either at NBC or Netflix. While the show was certainly a big hit when it first aired, it has arguably become an ever larger hit in recent years, being the most streamed series on Netflix by a landslide. One of the biggest questions and concerns about a potential revival of The Office would be who should and shouldn't return with the series. Assuming that this potential revival picked back up at Dunder Mifflin, the original company that the series revolved around, a few characters from the original series would still be around. However, this wouldn't apply to everyone, both due to the directions of their character arcs and the likelihood of the actors returning. With this in mind, here are the characters who should and shouldn't return for a potential revival of NBC's The Office. Dwight Schrute is among one of the most iconic aspects of the hit mockumentary series, with his actor Rainn Wilson receiving the top credit in the show after Steve Carell left. 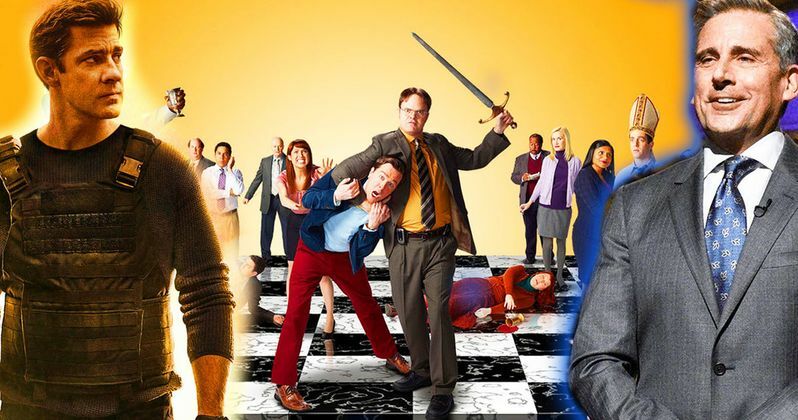 The series ended with Dwight finally accomplishing his dream of becoming the manager of the Dunder Mifflin Scranton branch, keeping him in the perfect position to remain the star of the series should it be picked back up. Who knows what the office is like now under Dwight's management? While Steve Carell as Michael Scott was arguably the best aspect of The Office, the series did a decent job at writing Michael out of the show, having him start a family with the woman he loved. Having Michael come back after finally getting his happy ending would just feel redundant and a misuse of his character, seeing as his lifelong dream was to be a parent. Additionally, Steve Carell has stated that he is not interested in returning for a revival, so Michael is definitely out of the picture should the series be picked back up. The final season of The Office featured an intriguing arc between two of the show's accountants, Oscar and Angela. By the end of the series, both Oscar and Angela were incredibly close, after being enemies for the duration of the season. Additionally, both Angela and Oscar seemed to have new arcs in the series finale, with Angela finally marrying Dwight and Oscar running for office. It would be great to see more of Angela's married life and Oscar's political life should the series be revived, and also to see if these two accountants have been able to remain close since the show ended. While Stanley was always an enjoyable character in The Office, taking almost no crap from his co-workers, the series finale revealed that Stanley had finally retired to a house in Florida after his wife divorced him. It would be incredibly difficult for the show to explain any reason why Stanley would need to leave retirement to return to the job he despised so much, making it incredibly unlikely for Stanley to return. The series finale of The Office featured the show's most dim-witted character finally being fired, which is honestly something that should've happened long before then, considering how bad he was at accounting. After being fired, Kevin opened up a new bar. While it would be unlikely for Kevin to return to Dunder Mifflin, he can still return as a recurring character should Kevin's bar become a secondary location in the revival. Ryan and Kelly's toxic relationship was certainly a fun part of the series, until both actors decided to leave unexpectedly before the show's ninth season. While it would be great to see more of Ryan and Kelly, just for the comedy factor, it unfortunately seems unlikely for either to return. Actress Mindy Kaling's career is currently bigger than ever, so she would more than likely be unwilling to return to her side role in The Office. B.J. Novak, on the other hand, has essentially retired from acting, so seeing him return seems equally unlikely. Though they weren't introduced into the show until the last season, Clark and "Plop" quickly proved themselves to be great additions to the cast. Clark's quirkiness added a new level of comedy to the series, while Plop proved himself to be the first normal person in the office, which actually helped to make the show feel less chaotic. Should a revival occur, we surely hope that these two characters are still shown working at Dunder Mifflin. It would definitely be reassuring if the show picked back up to reveal that Plop and Erin were still dating, as Erin never had any luck in relationships prior to Plop. Over the years, Darryl Philbin proved himself to be a hilarious character in The Office, going from just another side warehouse character to one of the starring members of the series. While it would surely be great to see more of Darryl going forward, the final season of the show featured Darryl moving out of state to work at Jim's sports marketing companies, giving him a job he was actually proud of. It would be a shame to ruin Darryl's happy ending only to bring him back to the job that made him so miserable. While Phyllis and Meredith rarely stole the spotlight in The Office, they were both essential characters in the series in all nine seasons. Should The Office receive a revival, it would feel incomplete without these two characters, making them practically essential to a potential revival, even if neither character was really an iconic aspect of the show. Toby added a lot of humor to The Office, but mostly due to the hatred that Michael held for him. Following Michael's departure, Toby was only really present in the show as an HR representative, very rarely adding any real humor to the episodes. The series finale featured Toby being fired by Dwight, and then moving to New York, where he should probably stay during a revival. It should be acknowledged that Toby's actor, Paul Lieberstein, was the showrunner for The Office for several of the show's seasons, so it's possible for Paul to return, just not Toby. Creed Bratton is one of those characters in The Office that was never the center of any episodes, yet still managed to steal the show with his strange attitude and mysterious past. It would be great to see more of Creed should the show be revived, possibly to learn more about where Creed came from. While the series finale did feature Creed finally being arrested, there are surely ways to write him back into the series all these years later. Following the departure of Michael, Andy Bernard became essentially the star of The Office for its last two seasons (to the joy of some viewers, and the disdain of others). While it would be great to see more of the 'Nard Dog in a revival, it seems unlikely due to two specific reasons: First, Andy made himself non-rehireable at Dunder Mifflin at the end of Season Nine purposefully so that he would be unable to return to the company. Second, his actor Ed Helms has become one of the most popular comedy actors in the industry, which would mean that it would cost NBC or Netflix a lot of dough to bring him back. While she sort of had a slow start in the series, Erin eventually proved herself to be one of the most hilarious characters on the show, with her quirkiness outshining nearly every other character. She had a unique perspective of almost everything that went down in the office, and a revival of the series would seem incomplete without her. Additionally, Ellie Kemper's latest TV series The Unbreakable Kimmy Schmidt just released its final season, so she should have some more availability in her schedule going forward. Much like Darryl, the series finale of The Office featured Jim and Pam leaving Dunder Mifflin so Jim could move and return to his sports marketing company, making it incredibly difficult to write this couple back into the series without ruining their happy ending. Additionally, John Krasinski has become a much more prominent actor in recent years, so it would be unlikely that he would want to return without a hefty paycheck. As sad as it may be, a revival of The Office would likely have to exist without the inclusion of Jim and Pam. However, there are surely new characters the show could introduce to become The Office's new central couple. While it's still unclear if NBC plans to revive this hit series, there have been plenty of rumors hinting that they may indeed bring it back. Additionally, it would certainly be a great idea from a financial perspective, considering that the show's popularity has practically peaked in recent years. Who would you like to see return in a potential revival of The Office? Comment and let us know!